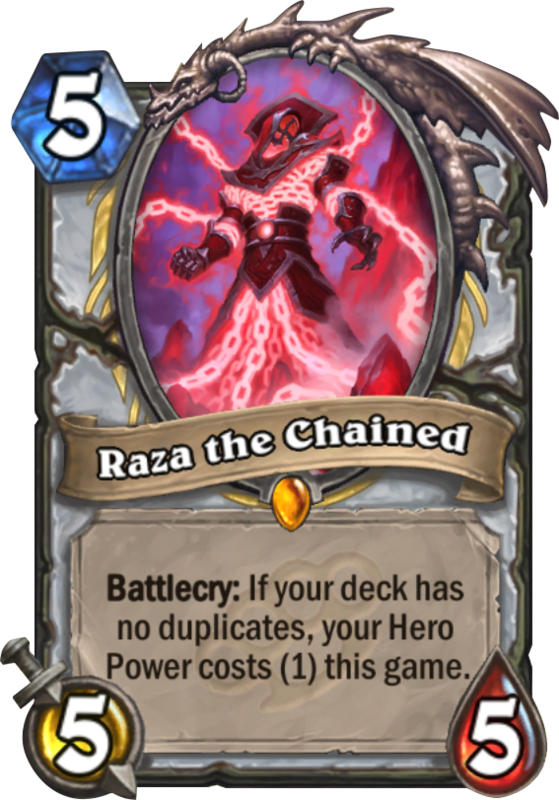 Raza the Chained is a 5 Mana Cost Legendary Priest Minion card from the Mean Streets of Gadgetzan set! Rating: 4.6/5. From 1669 votes. 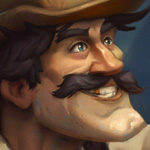 Have you noticed the subtle difference in wording compared to Reno. No double Shadowform in these decks – I reckon these new highlander cards will only work in ‘true’ single card decks and not in ‘I’ve used all my dupes, so now it activates’ decks. For all those of you wondering, a blizzard employee replied to the question of wether this works with justicar and whatnot, and it does. So thats a good thing to know, definitely increases my hopes for this card! 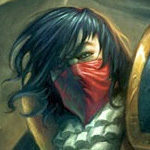 Will RenoPriest work? I doubt it. Why not create a strong legendary card that I can put in any priest deck. I´m already playing it for a few months and its pretty good, almost as good as reno mage. Can we combine it with finley? I wouldn’t bother with Justicar in a Reno Deck…..if you can get double Shadowform thats a free Darkbomb every turn and with a Garrison Commander thats a 2 mana Fireball…or just a free fireball next round if you can manage to get him to stick. You pull a Coldarra Drake from Shifting Shade after playing this card…. What exactly is this? I mean, I can’t distinguish her face, is it a man, woman or elemental? It’s an Etheral. The same race as Rafaam and Etheral Conjurer and Peddler. However this one is made of chains instead of cloth, hence the name. 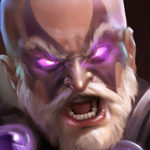 Raza transcends your foolish concept of gender, puny mortal! It’s the first thing that came to my mind. This kind of thing can’t exist in the game – too broken. Forget Justicar….double Shadowform it, gimme a free Darkbomb every round and a tournament medic and i’m good. True Casino Mage: 28 legendary cards, prince Malkazar and Codara drake. 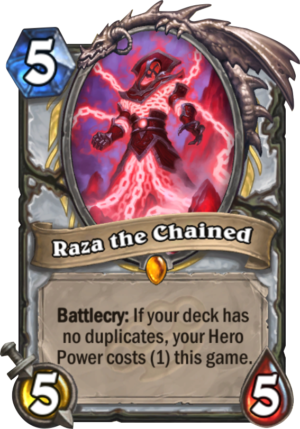 Pray for Raza to be added by Malkazar and draw Codara on turn 6 to win. You can only get neutral or your class legendaries from malkazar. Sarad, Beardo, and Paletress all seem like good cards for this kind of deck. 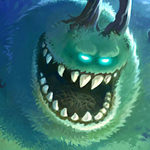 If you change your hero power after playing this guy (Finley, Justicar, Shadowform etc) will it still cost zero? I’m going to check on this, but I believe it will still cost 0. That makes Raza quite powerful. 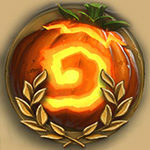 On turn 6 you can restore 6 health to your hero with your normal hero power and Justicar’s upgraded version. Even though this is a very powerful card I don’t think it will be worth sacrificing multiple copies of cards. I think Reno priest will be fun while Dragon and Control will be more competitive. 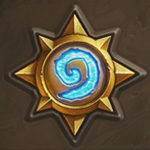 Can we have any Hope about Reno beeing traded to classic? I feel really bad about All those single copy decks because of that. Who is gonna Craft a card for just 4 moths? They also reveled fantastic cards for warloks that Will Be unplayable without Reno or anything similar. To many cards from this expansion are died without Reno. Reno will still be in Standard until early next year. So since it’s a battlecry and the wording says “this game” that means its from the rest of the game on. Effect doesn’t go away when he’s removed, right? I believe so, I’ll update when I get a response. I think it’ll be mostly a fun card, but I doubt it will actually be “OP” for consistency. 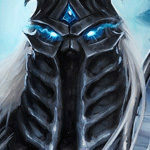 Priest relies heavily on comboing cards (auchenai, potion+cabal/SWP/Shadow Madness etc. ), having 1 card of each almost never works for priest. You will be proven wrong. Everyone who says this Card is Broken has Never try to Play Reno Priest, its absolutely bad and inconsistent. After 2K Priest Matches i can say, priest without combos is Garbage. Priest is not Mage. This Legenary/Effect is OK on turn 5 (5/5 + 2 heal), Great in The Following Turns 6-10, and just obsolet Turn 10+, priest Never Ever hat a Problem to manage The 2 mana for heropower After Turn 10. Most of The turns you in lategame you wont Play more than 1 Card, entomb pe whatever, Cause priest lack of Carddraw especially in Reno priest. Seems pretty good but I am not sure single cards decks Will Be good enough when Reno leves standard. Other cards that have good synergies like Justicar and the 5/4 inspire summon a legendary are out At 31dec, less that a month after the relese. The curve this in 5, Justicar in 6 and the legendaris summoner in 7 seems insane. 2016 has been a hard day for priests and they Will have they Revenge in december. Rotation is about April, so we will have some months. The standard rotation changes with the first new release in 2017, not on January 1st. So Reno will leave us around March or April. still 0 mana after shadowformed? I’m checking on this, but I’m pretty sure it would stay 0.